The Shadow’s Embrace brings the depth of a traditional CCG expansion to a new distribution format, without losing the flavor players come to expect from L5R. Alderac Entertainment Group tries something new this time around with a factory set for Legend of the Five Rings, releasing the full expansion as a direct-to-player (DtP) option where rarity is thrown out the proverbial window, possibly testing the waters of the “Living Card Game” distribution model. 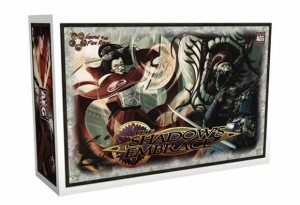 While AEG has released DtP sets before, The Shadow’s Embrace is distinctly different as it is a full size expansion. Previous DtP sets consisted of fewer, but noticeably more powerful cards. The change from a traditional expansion release to a factory set was announced as a way to stem the delays still being felt from the Emperor Edition base set release. For those readers unfamiliar with the factory set idea, the model removes the traditional random booster packs from the CCG equation and allows the player to purchase an entire playset of the expansion directly from AEG. The Shadow’s Embrace takes this all or nothing approach and modifies it slightly, where AEG has broken down the set of cards into various ways of purchasing them. Capitalizing on the factional loyalty the game and its community fosters, Clan Packs containing only Personality cards aligned with a specific Clan are the smallest portion of cards available for purchase, and the remaining, general purpose cards are sold together in a Strategy Pack. When purchasing the Strategy Pack from AEG’s store you also get a Clan Pack of your choice. You also have the option to purchase the expansion in its entirety for a relatively small upcharge. Overall the set continues the trend of the Emperor Edition tournament arc, introducing refined takes on powerful cards from previous tournament arcs, namely the Lotus arc. The unfortunate downside to the straight up conversion from traditional expansion to factory set is strongly felt in the surplus of cards that, frankly, will never be played competitively due to their underpowered design. These cards are a reminder that this set was originally designed to be distributed in randomized boosters, and as such cards specifically geared for a draft or casual environment needlessly flush out the card set. Featured in The Shadow’s Embrace are the Crane, Phoenix and Crab Clans. Each of these factions get a slightly buffed Clan Pack that includes a new Stronghold and Item card for their Clan, as well as an extra Unique Personality card. The Items continue the cycle of the Celestial Swords first found within the Embers of War expansion, and the Strongholds give each of the featured Clans an alternate Stronghold to play one of their most popular decktypes out of; dueling for Crane, Berserkers for Crab and spellslinging for Phoenix. While these new options feel very unique and different than their base set counterparts, none of them seem to be a direct upgrade in power level, which is probably good for the game, if a bit lackluster for those Clans, who with the exception of Crab, seem to need a shot of power to bring them up on the balance of the factions. To see the cards that are in The Shadow’s Embrace set, visit the L5R Oracle of the Void Database. The factory set also comes with dividers for all the clans and card types. These dividers aren’t like others that are simply taller cards, they are made of a thick plastic, like you see most credit cards made from. The quality of the storage box will make you feel like you’re storing your collection in a treasure chest! While the distribution of The Shadow’s Embrace leaves some of the set superfluous and likely to languish unused in one’s collection, overall the value (both in game and monetarily speaking) of the expansion offsets the larger initial cost of acquiring the cards, and plenty of the set will see competitive tournament play, making it a must own for all but the most casual card flopper. AEG has made the best of a bad situation in releasing The Shadow’s Embrace as a factory set and hopefully future expansions remain on schedule. The idea of the Clan Packs feels very natural for the game and is a distribution method that might be worth revisiting with future sets, allowing instant playability for casual players while still retaining collectibility if the Strategy Pack portion of cards remains packaged in randomized boosters. There is a lot of good to be found and discovered in this expansion, even considering the factory set model already gives you every card you’d ever need in a single purchase. With the political situation in the Empire degenerating, the Great Clans begin to place greater emphasis on their efforts in the Colonies. Previously given great freedom to pursue their own agendas, will the samurai of the Colonies rise to the challenge or chafe beneath the scrutiny? The Shadow’s Embrace is the first ever Factory Set for the fan-favorite Legend of the Five Rings Collectible Card Game from AEG. It is part of the Emperor Edition Arc, whose base set released in February 2012. Faced with tremendous opportunity and far from the eyes of the Empress and her direct rule, the Great Clans of Rokugan get entangled in a fight for new lands and a new balance of power. But what if all of it was orchestrated? Featuring Crab, Crane and Phoenix Clan Strongholds and Celestial Swords. 159 total new cards legal for the Emperor Edition Arc. Fantastic art from renowned artists in the industry, such as Steve Argyle, Mario Wibisono and William O’Connor, bringing characters to life both in the traditional Rokugan and the more exotic Colonies. Launches the conflict between the Great Clans over dominance in the Colonies, one that will undoubtedly have ripple effects over the entire Empire. 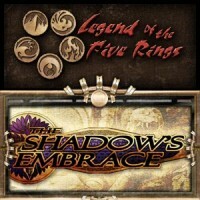 Add a Review for "Legend of the Five Rings – The Shadow’s Embrace"